The mighty IS&T team at Flywheel! Far left: Current student Kat Slump. Middle: IS&T alumni Rick Knudtson. Far Right: IS&T alumni Andy Peters. Omaha – Flywheel recently took home some impressive honors at the Silicon Prairie Awards: Best Culture of the Year and Startup of the Year. We caught up with Flywheel co-founder, Rick Knudtson, and senior software engineer, Andy Peters, both IS&T alumni, as well as intern and current IS&T student Kat Slump, to talk about start-ups and career advice. Congrats on your wins! It’s obvious you’ve tried hard to build a company that people want to not only hire, but work for. Do you have any advice for students that want to do the same? My partners and I are firm believers that your goal as an entrepreneur should be to put the best people in a room and give them freedom to do. Flywheel’s ability to find some early traction can be credited to our commitment to culture and building an incredible team. A lot of entrepreneurs get lost in the details and forget that the best companies are the ones that have employees that are just as passionate about the company as they are. So I guess my advice would be to focus on your team and success will follow. As a graduate of IS&T, what class and/or professor had the biggest impact on you in guiding your future career? I worked in a program called One Innovation Place - similar to The Attic at IS&T. It was my first taste of entrepreneurship and working with really smart people on what seemed an impossible task. We were building software that you could describe as a competitor to Microsoft Excel. It was an extremely innovative solution using bleeding edge technologies in ways no one had before. We were inventing something from nothing and it was a lot of fun. I knew that I always had a passion for building products but that opportunity just made me want to build something of my own even more. What’s the biggest misconception you think is out there about careers in IT? Why are you happy with your choice to pursue a degree in IT? I think people believe that if you work in IT you’re working behind the scenes and staring at a screen all day. There is certainly some of that (and that can be fun!) but IT graduates have an amazing perspective on logic and process. The way IS&T students think is extremely valuable to any organization in any department. Pairing Computer Science or MIS degrees with other fields is super fascinating to me and opens up a lot of opportunities for IT grads. Congrats on your wins! You’ve built your own businesses, and now you’ve made the decision to work for a start-up. Do you have any advice for students looking for their first full-time jobs after college? The biggest thing that changed my career is when I started making things and talking about it. There are so many easier ways to do that now than when I graduated. Surely there is a web/mobile app/game that you’d like to use yourself; go make one. Remember, a good company is more interested in your GitHub profile then your LinkedIn profile. What about for students looking to build their own company? Get involved, make good relationships and start creating. One way to ease into that is starting out with freelancing / consulting. Start freelancing on the side, but treat it like a real business. Learn from that, make relationships and ultimately be paid to help creating things for people. I met Dusty, Rick and Tony (the three co-founders of Flywheel) well before the start of Flywheel and now I work for them because I like being part growing businesses. My biggest impact was the college environment as a whole. I remember finally meeting people with same interest in programming, operating systems and business as me. I remember being in some programming labs, where we had a sense of competition and comradery to get done with assignments. On campus, I had access to computers, software, and people I never would have had access to. The environment at IS&T was motivating and what got me started on a the path I didn’t know I was looking for at the time. I am very happy doing what I have always loved, using computers to create new things and solve problems. Everyday I do work that seems like a hobby to me and I get to work with people who feel the same way. People in IT aren’t a bunch of nerds hidden in a corner closet doing computer things. Omaha has a great and growing tech community. There are a number of events, meetups and fantastic people here. Go to events and meetups to meet new people and learn more about what you are interested in. You’ll end up learning new things, meeting new people and by that accidentally growing your career. What do you like the most about working at a startup? How did you know the work and culture was right for you? I love everything about it. I love the culture, the people, the dogs (yes, we have dogs at work), the passion. Not many people receive the opportunity to work in an environment where they personally know each and every person in the company. In a startup, you may be given a role, but in that role you will most likely have to work with a variety of people within the company to complete projects- allowing you to touch different parts of the business. For students looking for internships, what advice do you have for them? Go to events. Network with people. 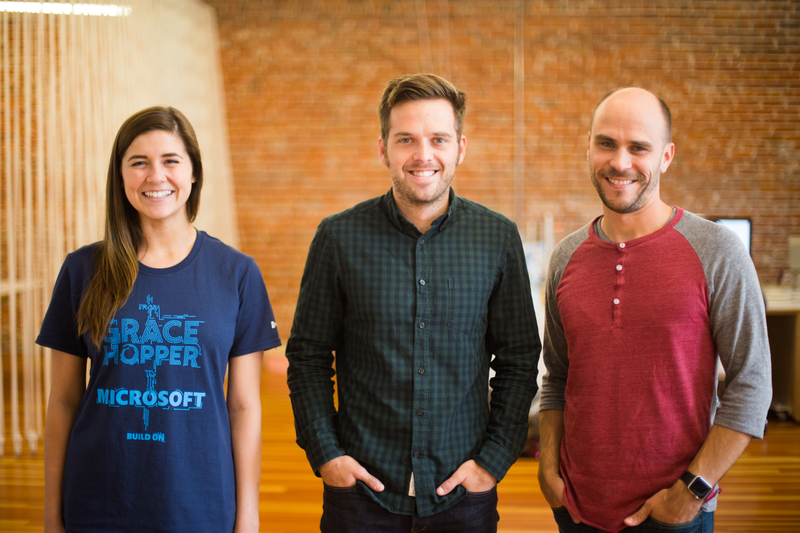 There are a lot of really awesome things happening in the Omaha startup community. If you find or hear about a company you are interested, contact them- even if they aren’t currently looking for interns. Chances are, they need your help and may be open to hiring or keeping in contact with you in the future. You’re a big advocate for closing the gender gap and encouraging more women to pursue an education and career in IT. What’s the best piece of advice you’ve received for young girls trying to decide if IT is where they want to go? Do what makes you “light up”. If that is solving problems, creating something from nothing, and helping people- tech is for you.